Valentine is around the corner and is one of the most beautiful days celebrated as symbol of love across the globe. If you are thinking how to surprise your special someone on this day and that someone special is Vietnamese women then we are here to give you some tips. Flowers, jewellery and heart shaped box of chocolates and other goodies would always be classic and standard gifts and she will accept them gladly! But if you want to try something which is ‘non-cliché’ (by the way Vietnamese women just love those!) then this post is for you! Expensive gifts don’t please them: If you are thinking to impress her with something that is expensive and pricey, then this means you still haven’t understood Vietnamese women! They are down to earth and their love is not measured on materialistic parameters! Rather small and priceless things impress her more! A bouquet of flowers, sweet dinner date, long drive or a full day outing would be appreciated more than the materialistic gifts. So just bring down the load and just try to spend some one-on-one time with her. Vietnamese women are impressed by your effort of strengthening the bond of this relationship which apparently doesn’t just happen by buying costly gifts! They love surprises: Vietnamese women are very excited about Valentine’s Day. They discuss it in their friend circle and talk about the hints that they give to their partners for reminding this day! They don’t want you to break your bank but little and sweet surprises do make them melt. It just makes them think that you do think about them and this little effort of yours just delights them. So plan something exotic may be a ride in rented limousine or doing some cooking or saying some love lines in Vietnamese for her can be few options! 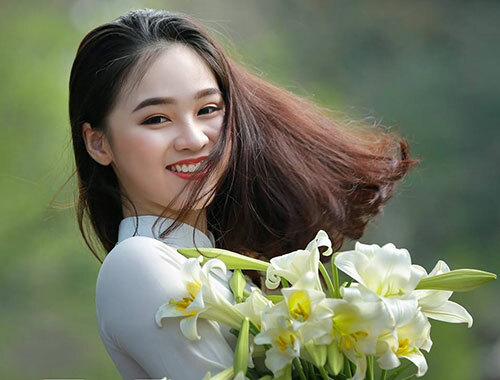 Be her present: If you are dating Vietnamese women, chances are that you must be sharing a long distance relationship with her. If that is the case then you have a golden chance to ‘be her present’. Just book the tickets and show up on that day! There is nothing which can win her heart more than your gesture of being together on this love day! With your presence, you will gift her most priceless thing in her life! Buy something meaningful: If you want to buy something (which eventually you will) then the suggestion would be to buy something meaningful. Something which she can keep at her desk or carry it along! You can consider giving herb planter for all weather crops (Vietnamese are in love with greenery), sleek and slender power banks, Polaroid, goodies of beauty products, cute printed t-shirt and love bands or necklaces! These non-cliché gifts will serve the purpose as well as remind them of you! We agree that gifts for your Valentine can depend upon your type of relationship you are in. Did you just start dating or have been together for years and thus it is fairly possible to overthink the whole thing. But when it comes to Vietnamese women then be little creative and vibrant! Don’t forget to wish her with a beautiful and touchy text message at midnight!